Q1. How nm command works? Q2. How to have file names precede each symbol in output? Q3. How to make nm display debugger symbols as well? Q4. How to make nm decode low-level symbol names? Q5. How to make nm only display dynamic symbols? Q6. How to use different nm output formats? Q7. How to make nm display only external symbols? Q8. What all sort options nm provides? Q9. How to make nm only display undefined symbols? Q10. How to make nm only display defined symbols? If you are a Linux user who is also into system level software development, you may find yourself in situations where-in you need information related to symbols in an object file. 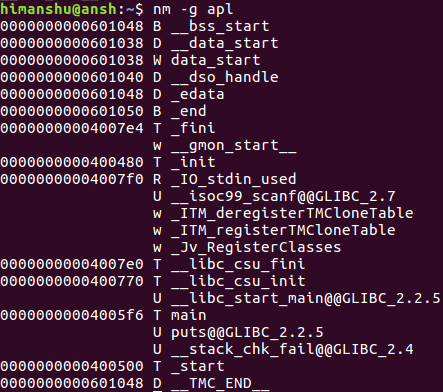 You'll be glad to know there exists a command line utility - dubbed nm - that you can use in these situations. In this tutorial, we will discuss the basics of this tool using some easy to understand examples. But before we do that, it's worth mentioning that all examples here have been tested on an Ubuntu 16.04 LTS machine. Following are some Q&A-styled examples that'll give you a better idea on how nm works. The three columns produced in output represent the symbol value, symbol type, and symbol name, respectively. There are several types of symbols - to know the complete details, head to the nm command man page. This you can do using the -A command line option. So you can see the file name was added in the beginning of each line. 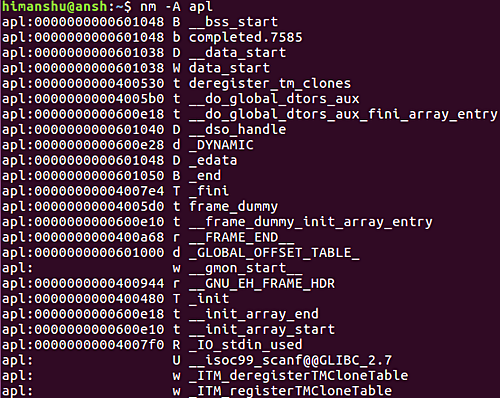 To make nm display debugger symbols as well in the output, use the -a command line option. The above command will display all symbols, including debugger-only symbols which are normally not listed. If you want, you can even force nm to decode low-level symbol names into user-level names. This you can do using the -C command line option. In case you want nm to display only dynamic symbols , rather than the normal symbols, use the -D command line option. 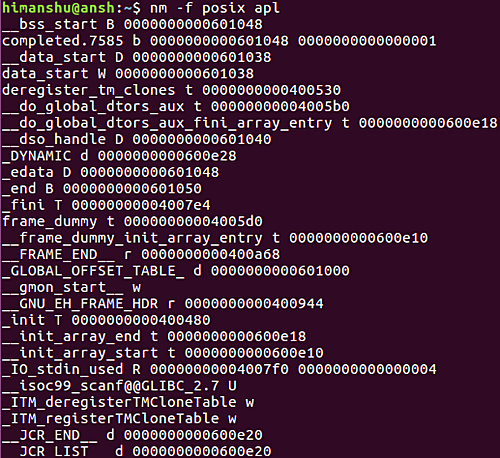 So you can see that nm only produced dynamic symbols in the output. 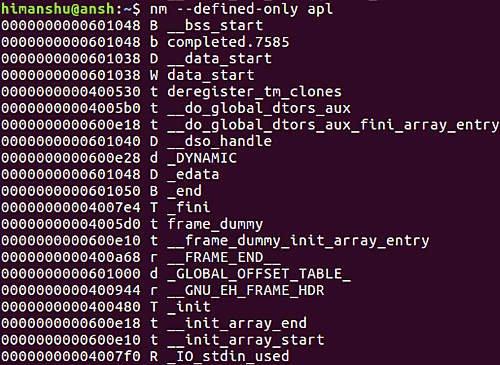 To enable different output formats, use the -f command line option. By default, the output is produced in the bsd format, however, if you want, you can enable 'sysv' and 'posix' formats as well. Observe the change in format now. This you can achieve using the -g command line option. By default, the symbols are sorted alphabetically. 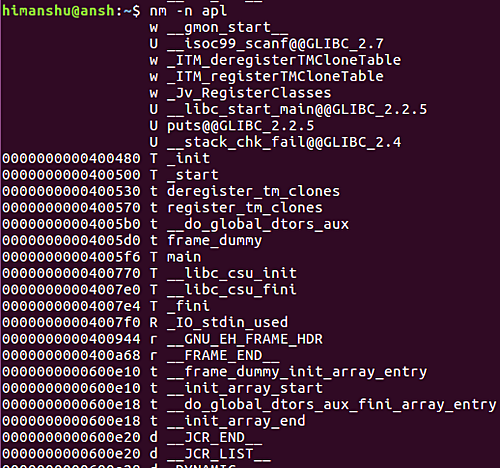 However, if you want, you can sort them numerically by their addresses using the -n command line option. So you can see the output is sorted by addresses now. In case you don't want nm to apply any kind of sorting (including the default one it uses), use the -p command line option. Moving on, to reverse any existing sort, use the -r command line option. This you can do using the -u command line option. To make nm only display defined symbols, use the --defined-only command line option. Agreed, the nm command has a niche audience, but my personal experience says even if you don't consider yourself as part of that audience, do keep in mind that such a tool exists. And for those who want to use this utility, once done with practicing all examples here, head to the nm man page to know more.